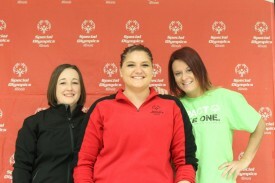 The trio found they had all volunteered for Special Olympics for several years and had teaching in common. Brawley, who starts a teaching job at Easter Seals in Chicago this fall, has volunteered for Special Olympics for six years starting in high school and continuing through her college career. Plikas, an early childhood special education teacher, has volunteered for four years, and Moss, who works in teacher benefits, has volunteered for three years. Their friendship further developed into group texts on the weekends and watching Chicago Blackhawks hockey games together. “The more we did events, the more we talked and became closer as friends,” explained Plikas. They even planned a bar crawl for their Palatine Polar Plunge in February. Their bar crawl was a success and they managed to raise $1,000. Along with powerlifting, the three friends volunteer at most Area 18 events. “Vicky and I usually do awards and Sarah is often a court manager,” explained Brawley.